Four people suffered bumps and bruises but no one was gored in the fourth day of the running of the bulls at Pamplona on Tuesday. The six fighting bulls weighing as much 620 kilos (1,360 lbs) stayed together in a pack for much of the dash, which was good because an isolated bull is more likely to get disoriented and charge at people. They run with steer that are supposed to keep the bulls in a tight pack. Four more runs remain at Spain's most famous summer festival. Three people — an American and two Britons — were gored in Monday's run but none was seriously hurt. The festival became world famous after Ernest Hemingway wrote about it in his novel "The Sun Also Rises." I personally think you'd have to be a little nuts to run with the bulls. But to each his own. 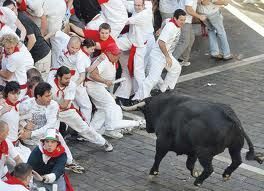 If I was a Bull I would enjoy getting the opportunity every year to try my best to run with some wacks screaming. Sounds like fun.